Something I never really talk a lot about is hair products I use, which is surprising especially since I went to college to study hair. 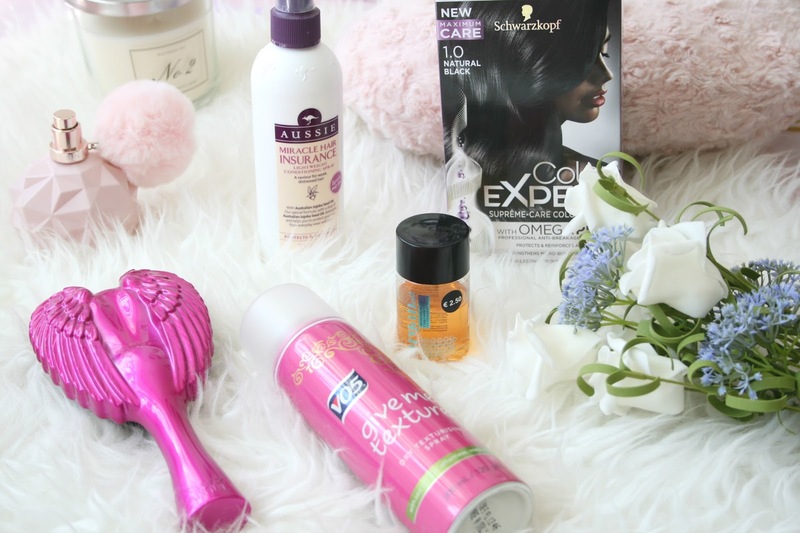 However today I thought I'd share the products I use to style my hair..because sure why not!? Starting with colouring my hair, cause you know your girl is old and has some pesky greys! I've been dying my hair since the age of 16 I've had red hair, pink hair, purple hair, blonde hair you name it really, I had it. Recently I got rid of my balayage and went back to my all black colour. I started using the Schwarzkopf Colour Expert hair dye and I absolutely love it. It contains Omega Plex oil to help keep the bonds of your hair as healthy as possible while dying it. They also give you a after 3 week treatment which I adore as it just gives your colour a refresh and the conditioner for after colouring is the best conditioner I've ever tried. It literally leaves my hair like silk and I'm obsessed. While the range of colours isn't as big as your typical hair colourants I'm so glad that Schwarzkopf released this range because it is fantastic. They also sell the conditioner and hair treatment separately in tubes and I'm definitely going to pick up the conditioner as it's currently on offer in Boots! After washing my hair I use the Aussie Miracle Hair Insurance Conditioning Spray. I use this more so as a detangle spray rather than a conditioner. Although it doesn't help the brush glide through my hair however I do feel it is keeping my hair in tip top shape. It smells absolutely divine and I'm practically at the end of this bottle so I'll definitely have to pick up another one. I also use Argon Oil in my hair, I'll normally use this when my hair is damp though I do sometimes run a little through my hair when I have it styled. It just gives a nice glossy healthy look to the hair. I actually got this little bottle from Primark and it's only €2.50 what a bargain! It is also lasting me absolutely ages. I've been obsessed with my Tangle Angel* ever since I received it. Due to bleaching and dying my hair so much it gets quite knotty. After breaking numerous amount of brushes I finally have found one that works and glides through my hair like theres not a problem in the world. And can we just talk about how pretty it is, I mean instagramable much!? I won't go on anymore about this because I wrote a post all about it which you can find here. Finally for a bit of oomph I've been using the Vo5 Give Me Texture Spray. I simply just straighten my hair and then spray this in at the roots and just toss it about a bit and its quite brilliant really to give you some volume and just to help give your hair a little bit of texture. Sometimes I love my hair straight but sometimes I prefer to have it a little tousled just to give it an extra something. What are your current hair product must haves? *This post contains PR samples, all opinions are 100% my own. Find out more about my Disclosure here. I've had black hair for years now, I was just like you during my teens - I had it every colour of the rainbow and bleached it about 15 times- it's pretty wrecked, but it could be worse! I find maintaining black hair almost impossible, I have to dye mine once a month and its honestly the bane of my life, I wish they'd come out with like, black bleach!